As per Plato's Symposium there are two kinds of Aphrodites (Latin: Venuses), the Aphrodite Ourania (Latin: Venus Caelestis), literarly the heavenly love goddess, corresponding to a love of body and soul and the Aphrodite Pandemos (Latin: Venus Naturalis, or, Venus Vulgaris), literally, the "Venus of the people," corresponding to physical love. By the late 5th century BC, philosophers separated Aphrodite into two separate goddesses, not individuated in cult: Aphrodite Ourania (Latin Venus Caelestis), born from the sea foam after Cronus castrated Ouranos, and Aphrodite Pandemos (Latin Venus Naturalis), the common Aphrodite "of all the folk," born from Zeus and Dione. Among the neo-Platonists and eventually their Christian interpreters, Aphrodite Ourania figures as the celestial Aphrodite, representing the love of body and soul, while Aphrodite Pandemos is associated with mere physical love. The representation of Aphrodite Ouranos, with a foot resting on a tortoise, was read later as emblematic of discretion in conjugal love; the image is credited to Phidias, in a chryselephantine sculpture made for Elis, of which we have only a passing remark by Pausanias. Thus, according to the character Pausanias in Plato's Symposium, Aphrodite is two goddesses, one older the other younger. 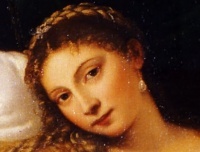 The older, Urania, is the "heavenly" daughter of Ouranos, and inspires homosexual male (and more specifically, ephebic) love/eros; the younger is named Pandemos, the daughter of Zeus and Dione, and all love for women comes from her. Pandemos is the common Aphrodite. The speech of Pausanias distinguishes two manifestations of Aphrodite, represented by the two stories: Aphrodite Ourania ("heavenly" Aphrodite), and Aphrodite Pandemos ("Common" Aphrodite). Unless indicated otherwise, the text in this article is either based on Wikipedia article "Venus Caelestis and Venus Naturalis" or another language Wikipedia page thereof used under the terms of the GNU Free Documentation License; or on original research by Jahsonic and friends. See Art and Popular Culture's copyright notice. This page was last modified 23:34, 30 March 2013.